Our consultants are London based trained Psychological Practitioners with a wealth of experience in both public and private sectors. The spectrum of experience stems from Mental Health to Occupational and Organisational Psychology, and all practitioners belong to professional bodies. We train your team to recognise the demands of the work itself and then find effective ways to manage these. Our initial free consultation will enable you to share your vision and then collaboratively find ways to reach it. PsycheMe® uses evidence based techniques to manage one’s stress to develop resilience and better coping strategies. 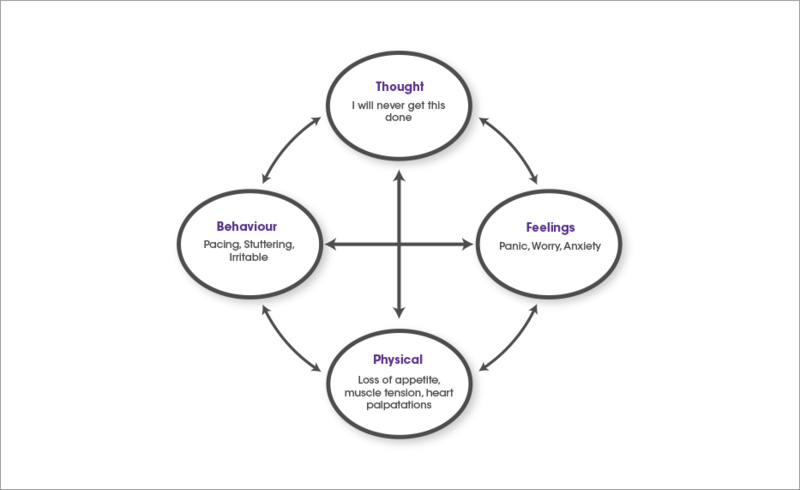 These techniques are based upon brief Cognitive Behaviour Therapy (CBT). We only use strategies that have been tried and tested and proven to work. This model helps us see that our thoughts, feelings, physical sensations and behaviours are all linked. Usually there is a trigger; in this case it is a pressing deadline. This then causes us to think negatively which has an impact on the way we feel. We may experience physical responses which in turn causes unhelpful behaviours which reinforce this vicious cycle. CBT focuses on the here and now and offers specific solutions to specific problems. It will work on cognitions and behaviours to help reduce physical symptoms and improve mood. In our current climate – what with targets, deadlines and the pace in which we work, it is almost impossible to reduce demands! Demands equate to Stress! So, what we can do is increase our ability to cope. Please see our services page for more details.